I've always loved rose products for my skin, so delicate, so gentle and so kind to my dry, sensitive and problematic skin type. Sometimes it's scary to try new products for my skin, especially on my face, as in the past I've suffered breakouts and even allergic reactions with new skincare, however with rose products I always feel safe. Safe to use them, safe to experiment and safe to mix and match... Which is exactly how I came to have these six products in my collection of products I use almost daily. My Mam has always had problematic skin, yet she has settled into a routine of using products including rose water for her skincare routine and it has really worked wonders for her. For years she has been telling me to give it a go. Like me, you may associate rose products as being overly floral and dare I say it, just for the older generations, but believe me, I have been swayed and I'm now convinced that it's not! There are a huge range of rose based beauty products available, so wether you're looking for something to hydrate, something to soothe or simply something that smells amazing, trust me, it's out there. 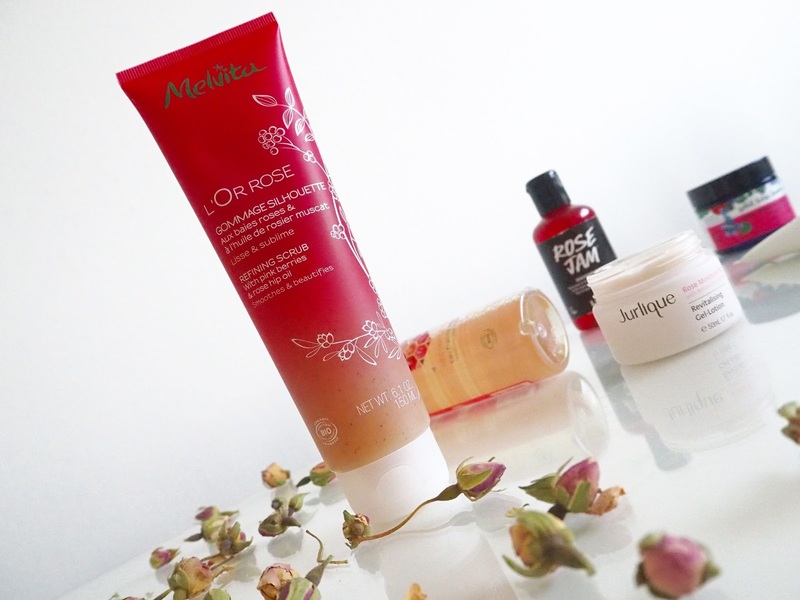 For the past few months I've been using the Melvita L'Or Rose Refining Body Scrub which is enriched with Argan and Rosehip oils and Pink Berries. Not only does this smell incredible (it's quite fruity rather than overly floral), but it feels wonderful on the skin. The gel like formula turns into a cream on contact with damp skin, which is a formula I really like for shower products. The small exfoliating beads work are slightly abrasive but not too harsh and they buff my skin to it's smoothest while the creamy formula moisturises my skin at the same time. An added bonus with this is that like with all Melvita products, it's completely natural and organic. 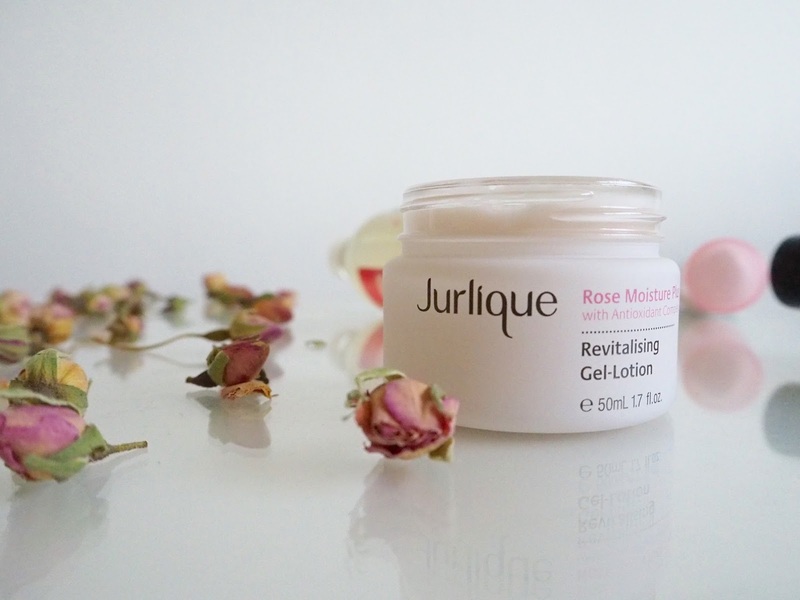 My first product from Jurlique is their Rose Moisturiser Plus Revitalising Gel Lotion, which my skin has been loving recently. Although I always moan about how I suffer with dry skin, I get oily around my chin and this little beauty has been helping me to balance everything out a great deal. I've been using this around two months, and still have so much left in the pot which is really impressive considering that I use this day and night... a little travels a very long way. My favourite thing about this, is how cooling it is to apply, it's so refreshing and enjoyable, especially as a bit of a perk up for my skin on a morning. It's also super lightweight on the skin, so my skin can really breathe from beneath it throughout the day. 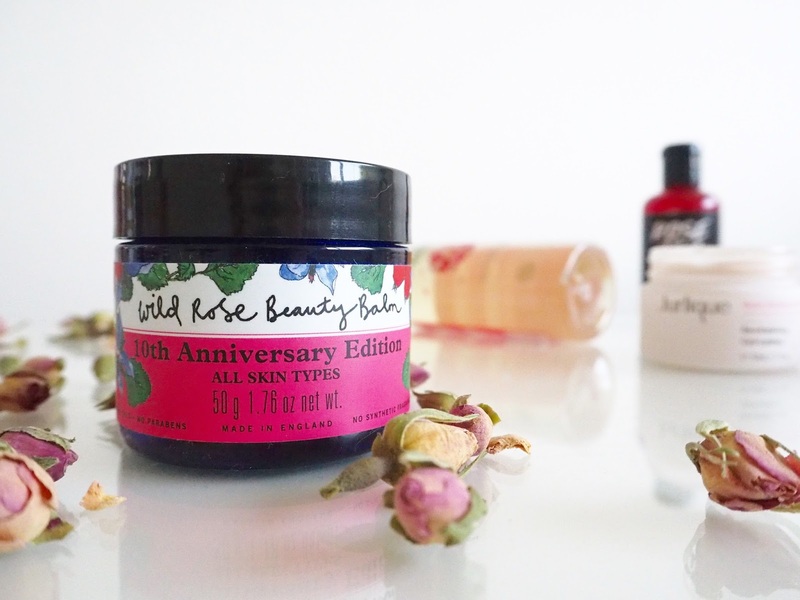 I have blogged about the Neal's Yard Wild Rose Beauty Balm before and it is still a product that I really rate for cleansing my skin. Another natural and organic brand, who use only the best ingredients means that I have 100% faith and trust in using their products on my sensitive face. The balm is packed with antioxidants and vitamins from the wild rosehip oil and leaves my skin feeling amazingly smooth and clean after use. This can also be used as a lip balm, nail and cuticle balm or as a face mask. 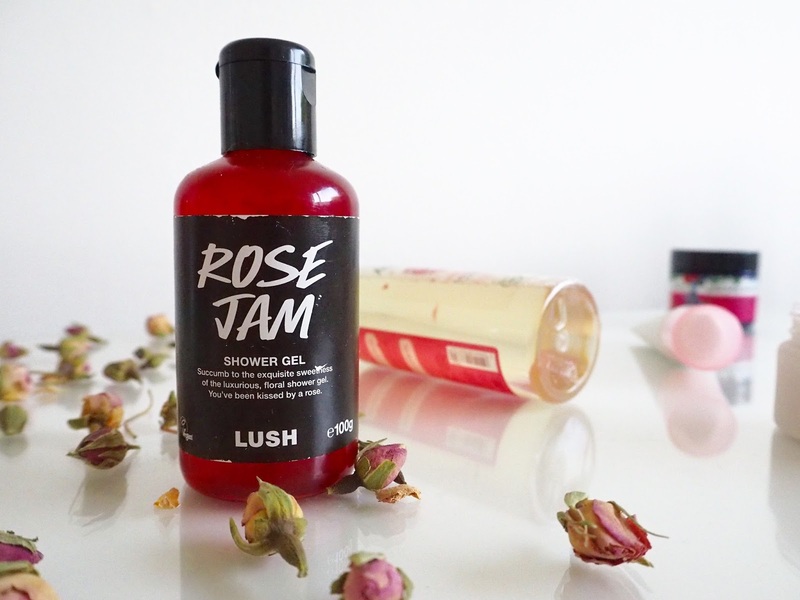 Every Winter I get excited about the Lush Christmas collection, mainly because I can stock up on my favourite; Rose Jam Shower Gel. If you've never used this before, you're really missing out on the most unique scent I have ever encountered; rose oil, vanilla, lemon oil and goji berry juice make for the most refreshingly sweet rose scent and as with all of the Lush shower gels, it's a scent which really lingers on the skin for a long time. I love this in the shower, or ran under the tap for a bubble bath... there's always a lot of lather from a really small amount of product and my skin always feels so soft after use... I'll definitely be buying plenty more of this before the season is over! Lastly there are two other Melvita products which have worked their way into my daily skincare routine. The Rose Nectar Fresh Micellar Water has that very traditional, floral rose scent, which is really relaxing for using at night to remove my makeup. It is enriched with wild rose petal extract and rose water, both of which are very gentle on even the most sensitive of skins, and very hydrating at the same time. I find that with a really light sweep of this on a cotton pad, the majority of the days makeup and dirt is removed, ready for cleansing and my skin is left feeling smooth and fresh. 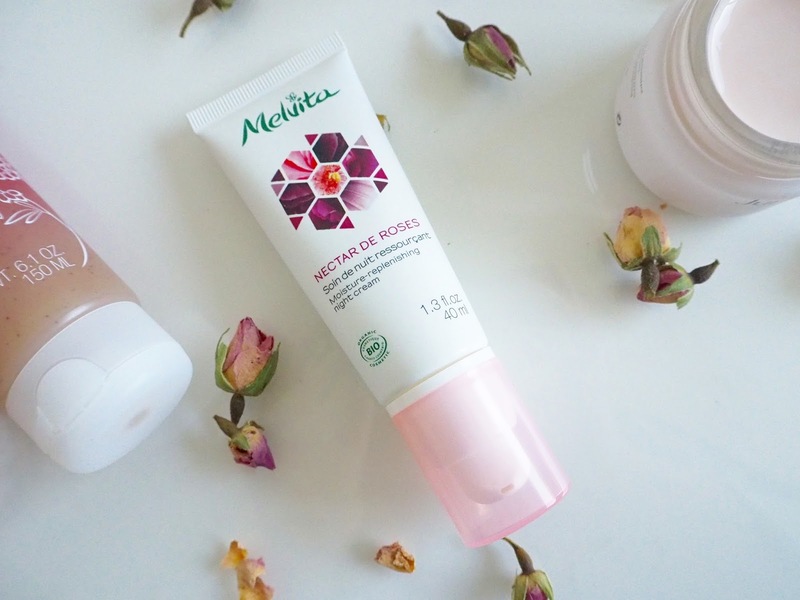 The other product is also a newbie to my night time routine; the Nectar De Roses Moisture Replenishing Night Cream, which boasts the same beautiful smell as the micellar water. This is a really light, yet rich cream which provides all night long moisture for the skin, nourishing as you sleep, while the active ingredients work to improve and increase your skins natural hydration. This is the first night cream I have ever used continuously, wether thats because I'm getting old or because it's doing something special for my skin is a bit 50/50, but at the minute my skin needs as much brightening and moisturising as it can get and this definitely does the trick on both counts! 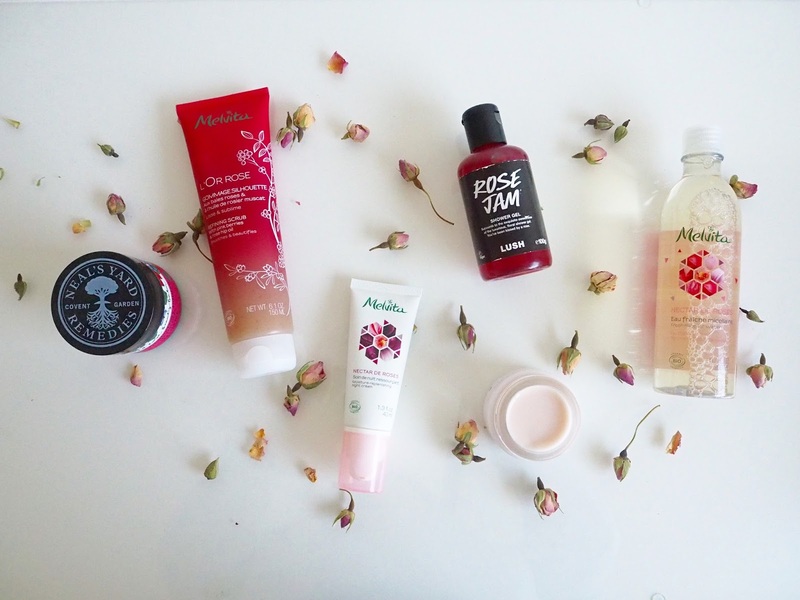 Do you use many rose products for your skin?